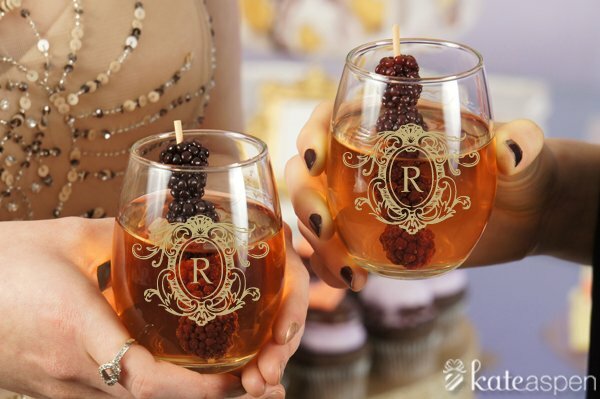 These gorgeous stemless wine glasses favors are a practical way to further demonstrate your creativity and style with the personalization options! These glasses make a great gift that your guests will ensure your guests will be recalling your special day for years to come. Other than using them simply as wine glasses, other great uses include candy and tealight holders or add your favorite dessert. Can we order white boxes as shown in the pictures listed for the 9oz wine glasses? Thank you! 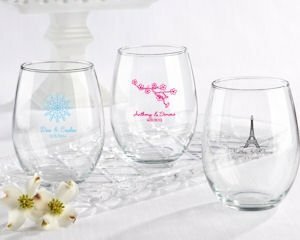 I'm sorry the Personalized 15 oz Stemless Wine Glasses Favors do not have a box and the box for the 9oz can't be purchased separately, it can only be purchased along with the item. 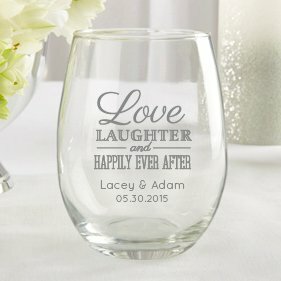 Is the design on these glasses laser etched? Hi Kathleen our Personalized 15 oz Stemless Wine Glasses Favors are screen printed and not laser etched. Is there any way to have more than 20 characters per line of personalization? I'm sorry, you can't exceed to the number of characters per text line because if you do, the text will be cut off. You can add up to 4 text lines for this Personalized 15 oz Stemless Wine Glasses Favor but it would also depend on the design you'll pick. Other designs will only allow 2 text lines.